This wedding guest book with real foil printing comes in a classic 12x12 size with a classic sweeping script personalizing your names on the hard cover. 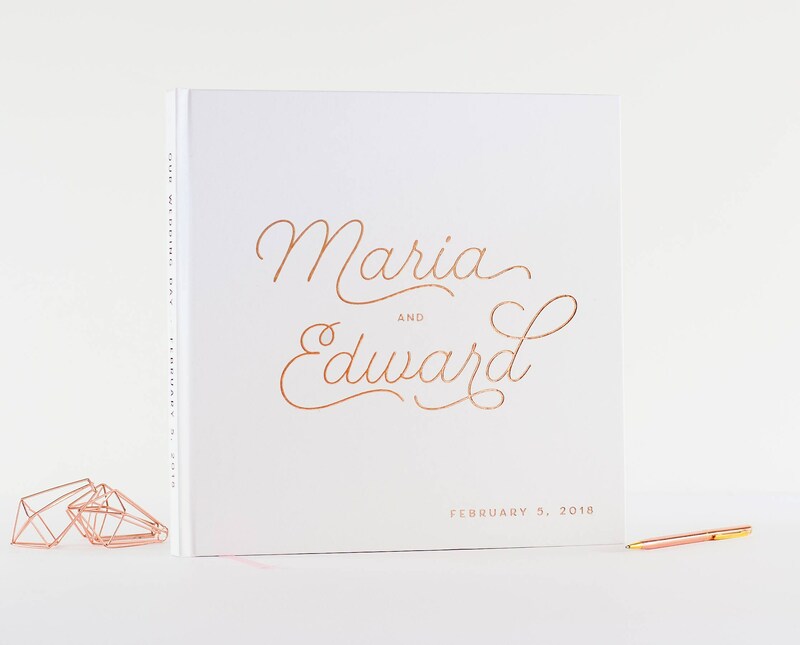 Your wedding date is also featured on the corner of the cover of this stylish wedding guest book or wedding album. The classy, timeless design is available in rose gold foil, gold foil or silver foil and also features 5-6 words of your choice on the spine. Shown here in a classic white cover color, we can also customize the color cover to your liking (inquire for our color palette). The classic look of this cover design celebrates your Best Day Ever and coordinates well with almost any wedding theme! **Design note: The names on this design will vary in how they are offset or more centered in relation to one another depending on how long they are. The relative size may also be decreased to fit longer names (such as 9+ characters). Each book is typeset by hand, so we will adjust the names you provide to fit within a pleasing arrangement in the general style shown.